What about a wireless storage device that will helps you to store data and transfer them between your mobile devices.Sandisk comes up with such a device,The SanDisk Connect Wireless Flash Drive ,instantly adds up to 64 GB of storage space to your iPad, iPhone, Kindle Fire, and Android devices. Portable and easy to use, the drive gives you wireless mobile access to your movies, photos, music, and documents. You can wirelessly connect up to 8 devices and stream media to as many as 3 devices simultaneously-without the need for an Internet connection. It has a range of 150 feet, streams up to 4 hours of video on a single charge, and recharges via your computer’s USB port. 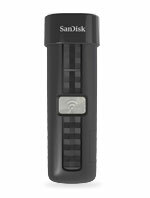 The SanDisk Connect Wireless Flash Drive works with iPad, iPhone, Kindle Fire, Android devices, and both Windows and Mac operating systems.It can wirelessly connect to as many as 8 devices. It also lets you stream media to up to 3 devices at the same time. You can listen to your favorite songs while the kids watch two different movies on mom’s iPhone and dad’s iPad.The available capacities are 64GB,32GB and 16GB.Since it have a mobile help which will helps you to organize all your media files for easy storing, sharing, and streaming. And the App is available in Google Playstore , App Store and Amazon Apps. Click Here to get How To Connect? videos and other technical specification information.